Author's note: Interesting how time flies -- I did this case mod over a year ago (in fact, this writeup was last modified exactly one year and two days ago) and never got around to finishing or posting it. Well here it is, in its somewhat outdated state as it is no longer in service; I have moved onto a G5 and a much more powerful system. 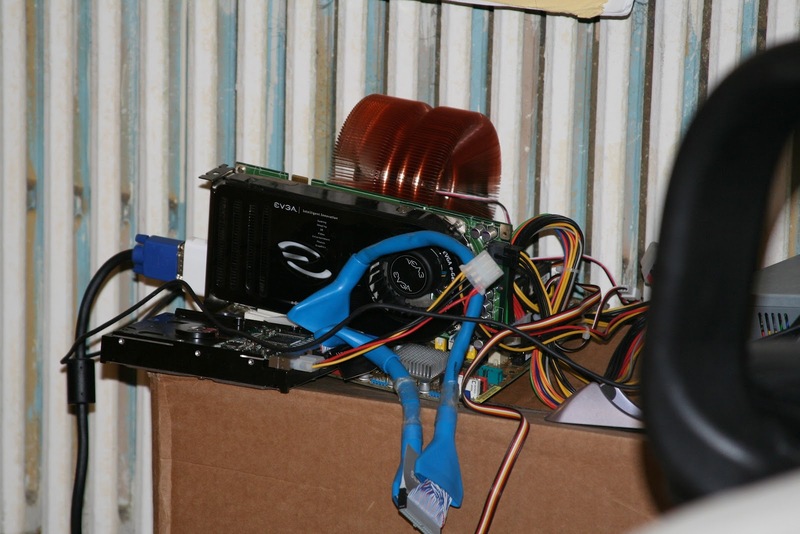 and if y'all remember my spring cleaning images of the unusually clean fan and GPU, you probably are thinking, ``Man, you need to get a new case with better airflow.'' So from that sentence, I took away two things conveniently highlighted in bold: new case and better airflow. 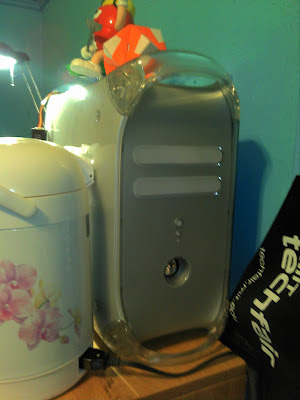 Conveniently, I had a spare Quicksilver Power Mac G4 case that I had found in a (not-so)-secret location at MIT and had been inspired ever since 7th grade by the awesome folks at InsanelyMac (formerly OSx86) to do a case mod. Now that I'm a few years older, more mature, and know a teeny bit more about mechanical engineering and manual labor, I set out to mod the case! On the surface, the Power Mac G4 cases were relatively compact and had terrible airflow. They were comparable to micro-ATX boxes with four or five PCI slots and had an opening for an ATX-sized power supply vertically slotting next to the ports. Unfortunately, there are no conspicuous openings on the front of the case other than the drive slots (which aren't even open most of the time). As a purist, I decided not to mess with the external structure of the case and figure out an alternative method to deliver fresh air into the case. The back of the case was relatively porous; I decided to use the lower holes to pull air into the take (still have to design an intake chamber out of cardboard) and use the power supply hole to expel hot air. 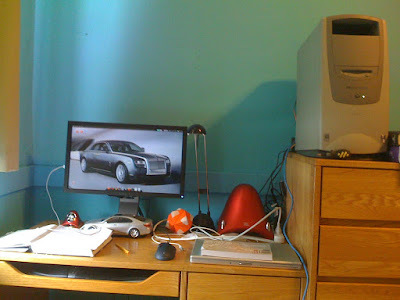 Another constraint of which I needed to be aware was the location of the power supply. Since I wasn't using the default location for two reasons, (1: my cooler would have been obstructed and 2: hot air needed to be expelled), I mounted the power supply on the top of the flip-down door. Putting it at the bottom (near the hinge) of the door meant obstructing the full-height-ness of the PCIe slot, which would mean not being able to install a full-height graphics card, i.e. the lovely AMD Radeon 6990. In order to mount the PSU, I needed to fabricate an L-shaped bracket to secure the bottom of the PSU to the door (and secure the top by permanent-tieing the wires coming out of the PSU). 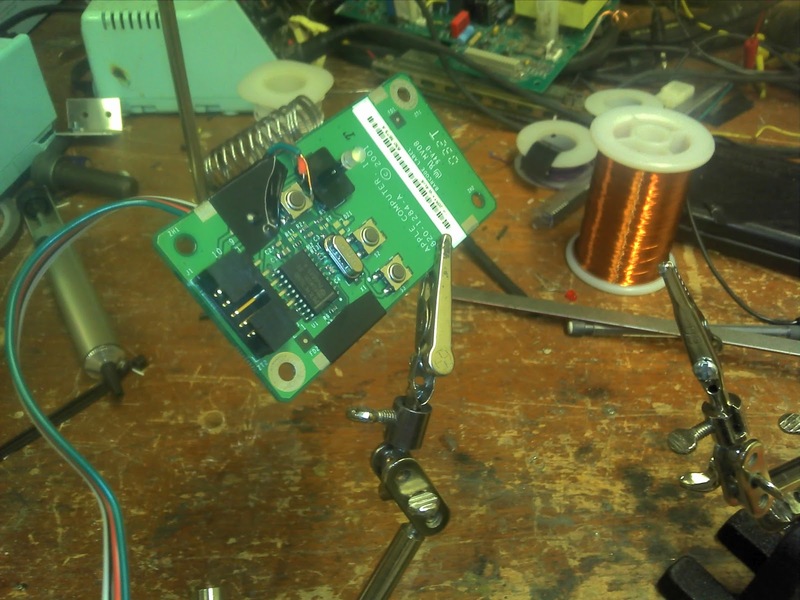 This design was much simpler to create than MacBane's PSU mounting solution, whose procedure I perused many times in preparation (yes, all 33 pages). Enough of design constraints vomit. I started modding the case during winter break, which meant trivial progress. 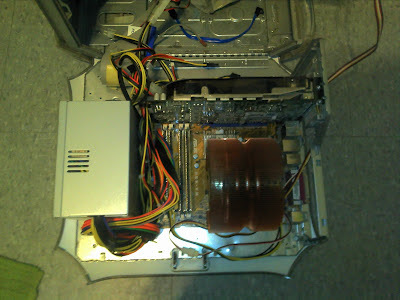 Then one weekend in March, I got my act together and cut/drilled holes to install the motherboard (this was also the week when I decided to clean my fans). Unfortunately I did not bring my CPU fan home so I had no idea whether it would fit in my preliminary mod. When I brought the case back to MIT and tried to install everything, the Zalman cooler obstructed the door from closing! I then had to uninstall everything, shift everything down one PCI slot (the Quicksilver Power Mac had five slots), cut through the first PCI slot, redrill all the holes, and remount everything. The Power Mac G4s are notoriously known for a lack of front-to-back airflow, in stark contrast to the Power Mac G5. 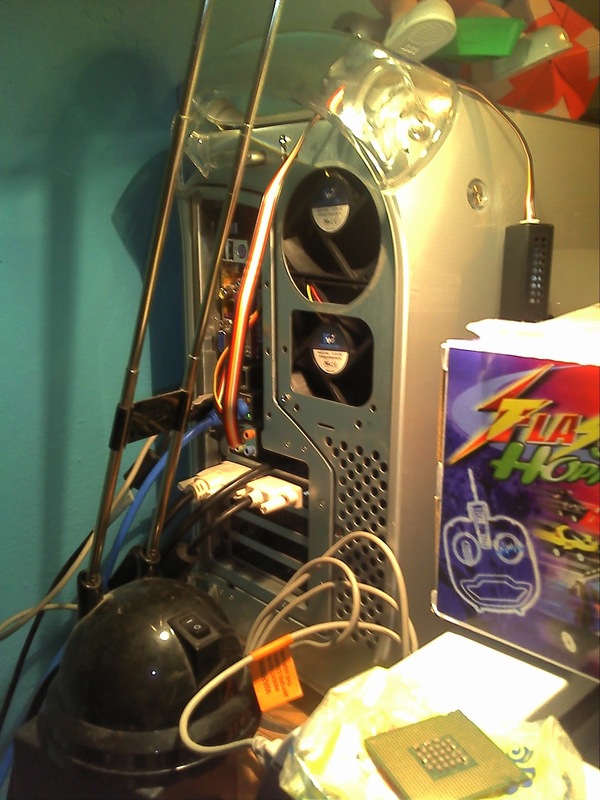 I went to MicroCenter and picked up two cheap 92mm fans, which I mounted in the hole left by power supply vacancy. In addition, I drafted up a shroud to route air into the case. The shroud had an L-shape; it used the narrow set of holes below the exhaust for intake and brought air up to approximately where the RAM was when the door was closed using a 120mm fan. It was created using several pieces of 1/8" acrylic cut using a bandsaw. Because it was composed of multiple parts, I chose to assemble the product using superglue (or whatever acrylic glue exists), which turned out to be a horrible idea because it's not strong enough. Epoxy probably would have been a much better choice. Similarly, because of a lack of sufficiently strong adhesive, this shroud has not been installed. Any self-respecting case modder or computer enthusiast does not deny herself a power button. Since the G4's power button actually stabs a surface-mount button on a PCB with a couple other functions (LED, reset, etc), I soldered some breadboard wires to connect the PCB to some female headers to connect to the motherboard. So I misinterpreted your question -- if you meant ``*to* the left of the case,'' then still no, it's a hot water heater.